In “Using Volatility to Improve Portfolio Diversification,” we suggest that volatility can be deployed as a superior diversifier of US equity portfolios compared with more commonly used asset classes such as cash, bonds, real estate, and commodities. But that is not the only benefit of investing in volatility. As we will demonstrate, volatility, as measured by the Chicago Board of Options Exchange’s VIX index, can generate returns in excess of US equities (as represented by the S&P 500 index) in many market environments as well as over full-volatility cycles. Volatility is exceptionally prone to mean reversion. Volatility cycles tend to be shorter in duration, more frequent, and of higher velocity than equity market cycles. Before we begin, let’s address a commonly asked question about volatility investing - If investing in volatility offers so many advantages over other asset classes, why haven’t elite investors been doing this for years? In short, the reason is that the practical ability to invest in volatility is a relatively recent phenomenon. Lastly, on a practical level, it is one thing for tradable securities to exist and another thing for sufficient volume in these securities to allow for necessary liquidity. As shown in Figure 1, as recently as 2009 the average daily trading volume in VIX futures was only $133 million. By early 2018 that volume had soared to more than $5 billion with no slowdown in sight. This allows investors ample liquidity and dramatically reduces slippage when participating in the volatility asset class. Now let’s look at volatility as an Alpha generator. Alpha is a measure of the active return of an investment compared with a suitable market index, or benchmark. For an investment manager to create Alpha, a performance record of returns in excess of the appropriate benchmark (in this case the S&P 500) must be achieved, net of all fees and expenses. In its first three years of operation, the Phoenix Capital Fund created a return stream that generated 365 basis points per year in excess of that of the S&P 500 (or stated alternatively, generated 3.65% per year in Alpha). Specifically, the S&P 500 returned an average of 9.1% per year during this period while the Fund returned 12.75%. Phoenix Capital Fund has been able to create Alpha over prolonged periods of time because the nature of volatility differs significantly from the nature of equities. Let’s review some differences. When comparing US equities with volatility (Figure 2), the first noticeable difference concerns directional bias. The US equity market, while continually vacillating, exhibits a significant upward bias over time. Pick any point it the history of the S&P 500 and the longer we extend our timeframe forward, the higher the chance the S&P 500 rises in value. By contrast, the VIX has no directional bias. Like the S&P, it bounces up and down over time, but over long timeframes, it is statistically no likelier to end any given period at a high value than a low value. One of the reasons the VIX fails to display a directional bias is because it is incredibly prone to mean reversion. Unlike other indexes, the VIX is not a theoretical basket of securities that rises and falls in lockstep with the aggregate value of its underlying constituents. 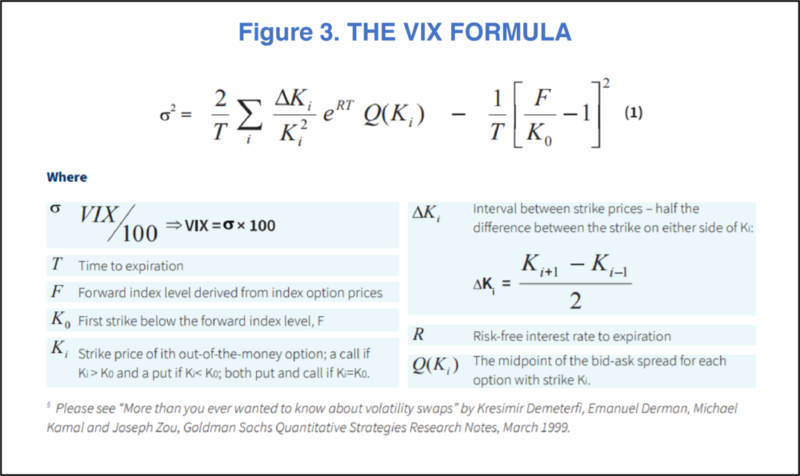 Instead, the VIX is a complex mathematical formula (Figure 3) involving the ratio of newly created, near-term put and call options tied to the S&P 500. The VIX is expressed as a numerical figure, with higher values suggesting a higher level of implied volatility (or a higher level of ‘fear’) in the market. Due to its unique construction, the VIX tends to trade in a range-bound fashion. Since its inception, the VIX has reached as high as 89.5 and as low as 8.6 while averaging 19.9. However, the vast majority of the time, you can find the VIX trading in the bottom half of its mathematically constrained range. Since its inception, the VIX has closed below 30 on 91.3% of all trading days, closed below 40 on 97.3% of all trading days, and closed below 50 on 99.1% of all trading days. Another difference of note between volatility and equities becomes apparent when analyzing patterns in their respective futures contracts. VIX futures contracts trade in a state of contango (Figure 4) the vast majority of the time. In fact, since 2010, VIX futures contracts have closed in contango on 83% of all trading days. Contango occurs in a managed futures portfolio when current prices (or prices of futures contracts expiring in the near future) trade at incrementally lower levels than futures contracts expiring later in time. The opposite of contango, known as backwardation, occurs in a managed futures portfolio when current prices trade at incrementally higher levels than futures contracts expiring later in time. For volatility, the natural and logical state of managed futures is that of contango, and this is an essential factor in the proper management of volatility. We can count on the fact that (subject to relatively infrequent and temporary exceptions) volatility trades primarily in contango and can leverage this fact for the benefit of investors. The next significant difference between volatility and equities is that they tend to follow two very different cycles. A full equity market cycle is measured as the period between two market highs or lows. In other words, any conjoined bear and bull market constitutes a full equity market cycle. Since 1903, US equity markets have generated 11.5 market cycles. Thus the average full equity market cycle has lasted for a period of about ten years. Volatility cycles, on the other hand, are typically of significantly shorter duration, greater frequency, and higher velocity, which make them ideal for opportunistic trading. Figure 5 shows an extreme example involving the most recent equity bear market and its subsequent recovery period. Over the course of the 2007-2009 bear market, the VIX index experienced full recovery in about 26 months—only 40% of the 65 months required by the S&P to achieve full recovery. Further, the comparative recovery portions of these cycles were even steeper. The VIX recovery period was less than 14 months, only 29% of the 48 months required by the S&P 500. The velocity by which volatility tends to revert in the direction of its mean can be astonishing—particularly when the VIX is at an abnormally high level. Consider Figure 6 which depicts the VIX’s reversion toward its mean in just 7 trading days following its all-time high recorded at 10:05 am on October 24, 2008. In the course of 7 trading days, the VIX mean reverted from 89.54 to 47.73—fully 58% of the amount necessary to achieve full recovery. This demonstrates that not only is the VIX prone to mean reversion; it can revert with extreme velocity as its level becomes progressively more disjointed from its normal trading range. To summarize, over the course of many market environments as well as over full-volatility cycles, we believe volatility offers investors the chance to realize a return stream that can be greater than that of US equities. This stems from the facts that 1) the VIX is prone to extreme mean reversion, and 2) volatility cycles tend to be of shorter duration, greater frequency, and greater velocity than equity cycles, all of which combine to create a greater opportunistic trading environment than is the case with US equities.